SOLANA BEACH — The Del Sol Lions Club marked its eighth anniversary with a Mardi Gras-themed party Feb. 27 at Fletcher Cove Community Center. But it turned out to be a bigger Fat Tuesday celebration for two local charities that received a total of more than $46,000 from the philanthropic organization. 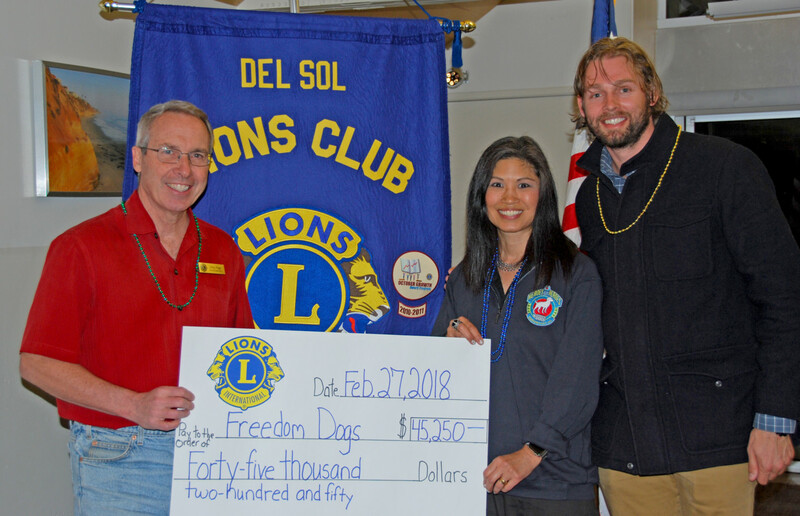 Freedom Dogs, which provides service canines to veterans with post-traumatic stress disorder, received a $45,250 donation. A $1,300 check was presented to The Blind Stokers Club, which pairs sighted riders with stokers — the rear riders on tandem bikes — who cannot see well enough to pilot a bike. The Del Sol Lions Club was chartered Feb. 15, 2010. Linette Page, the organization’s vice president of programs, noted that since then the local club has completed 190 service projects using 9,359 volunteer hours. Of the $156,000 earned, $137,000 has been donated back into the community. The Del Sol group is part of Lions Clubs International, a service organization with more than 46,000 local clubs and 1.4 million members serving the less fortunate in over 200 countries. The Del Sol Lions Club meets at 5:30 p.m. on the fourth Tuesday of the month at Fletcher Cove Community Center, 133 Pacific Ave., Solana Beach. Visit https://www.e-clubhouse.org/sites/delsol for more information.